On May 31 2017 Kleiner Perkins Caufield & Byers partner Mary Meeker delivered her annual internet trends report at the 2017 Code Conference in California. The goal of Internet.org – an initiative launched in August 2013 by Facebook, Ericsson, MediaTek, Nokia, Opera, Qualcomm and Samsung — is to connect the 4.4 billion people who currently lack access to the Internet, but a mission on such a large scale is not without barriers, and a study released Wednesday by McKinsey & Co., Offline and Falling Behind: Barriers to Internet Adoption, examines those barriers. 3.4 billion of the 4.4 billion people without Internet access are located in 20 countries. 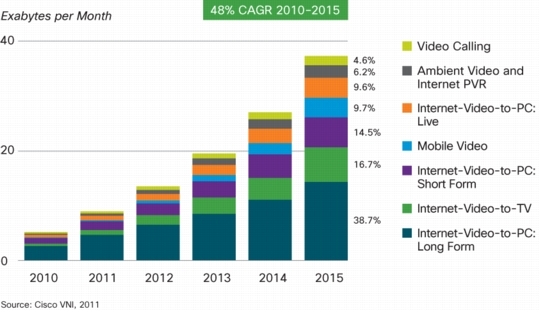 1.1 billion to 2.8 billion of them are outside the range of existing mobile networks. 920 million of them are illiterate. Women in developing countries are 25 percent less likely to be connected than men. Over the past decade, the global online population grew to just over 2.7 billion people, driven by five trends: the expansion of mobile network coverage and increasing mobile Internet adoption, urbanization, shrinking device and data-plan prices, a growing middle class and the increasing utility of the Internet. The online population is expected to grow by another 500 million to 900 million by 2017, meaning that 4.2 billion people will still be offline. Some 75 percent of the offline population is concentrated in 20 countries, and those people are disproportionately rural, low-income, elderly, illiterate and female. The offline population faces barriers to Internet adoption spanning four categories: incentives, low incomes and affordability, user capability and infrastructure. McKinsey & Co. found a systematically positive and, in some cases, large correlation between barrier categories and Internet penetration rates. Some 2 billion of the offline population of 4.4 billion live in 10 countries that face challenges across all four barrier categories, and 1.1 billion are in countries dominated by a single barrier category (more details below). Current initiatives, forthcoming innovations and lessons from countries that have made headway are cause for optimism. High barriers across the board: Bangladesh, Ethiopia, Nigeria, Pakistan and Tanzania. Medium to high barriers: Egypt, India, Indonesia, the Philippines and Thailand. Medium barriers, greatest challenges in incentives: China, Sri Lanka and Vietnam. Medium barriers, greatest challenges in low incomes and affordability: Colombia, Mexico,Brazil, South Africa and Turkey. Low barriers across the board: Germany, Italy, Japan, South Korea, Russia and the U.S. The Global Solution Networks program at the University of Toronto has released a two part research report The Remarkable Internet Governance Network, authored by former Internet Society President/CEO Lynn St. Amour, and GSN Executive Director Don Tapscott. The report is intended to assist governments and organizations to better understand the Internet governance network and how to help it succeed. [St. Amour and Tapscott] describe the multi-stakeholder model of Internet governance, why it works remarkably well and what needs to be done to ensure a robust, global, accessible and effectively governed Internet for future generations. [They] applaud the NTIA decision as a natural step forward and a significant confirmation that the multi-stakeholder model is effective and legitimate. They explain that evolving the global multi-stakeholder ecosystem is not only right and timely, but also the best way to address some of the thornier policy issues global society faces. These issues range from privacy, security and Net neutrality, to access and intellectual property. In a report released May 2, 2013, Copyright in the Digital Era: Building Evidence for Policy, authors Stephen A. Merrill and William J. Raduchel of the National Acadamy of Sciences call on federal agencies and foundations to support a broad range of empirical research studies to contribute to the comprehensive review of US copyright law recommended by Register of Copyrights, Maria Pallente, and announced April 24, 2013 by House Judiciary Committee Chairman Bob Goodlatte. The report also urges the federal government to consider instituting two regular, systematic surveys – one of businesses on their acquisition and use of intellectual property of all types and the other of consumers to understand how digital content is created and used. Over the course of several decades, copyright protection has been expanded and extended through legislative changes occasioned by national and international developments. The content and technology industries affected by copyright and its exceptions, and in some cases balancing the two, have become increasingly important as sources of economic growth, relatively high-paying jobs, and exports. Since the expansion of digital technology in the mid-1990s, they have undergone a technological revolution that has disrupted long-established modes of creating, distributing, and using works ranging from literature and news to film and music to scientific publications and computer software. In the United States and internationally, these disruptive changes have given rise to a strident debate over copyright’s proper scope and terms and means of its enforcement–a debate between those who believe the digital revolution is progressively undermining the copyright protection essential to encourage the funding, creation, and distribution of new works and those who believe that enhancements to copyright are inhibiting technological innovation and free expression. Copyright in the Digital Era: Building Evidence for Policy examines a range of questions regarding copyright policy by using a variety of methods, such as case studies, international and sectoral comparisons, and experiments and surveys. This report is especially critical in light of digital age developments that may, for example, change the incentive calculus for various actors in the copyright system, impact the costs of voluntary copyright transactions, pose new enforcement challenges, and change the optimal balance between copyright protection and exceptions. The report is $35 for paperback, but free for online viewing or download. A summary is available. Dave Burstein in Fast Net News – Russia Passing U.S. In “Fiber” – reports that Russia is on the cusp of passing the USA in terms of percentage of residences reached, either directly by fiber, or by some fiber+LAN system. All in the name. Korea’s #1 in penetration if 100 megabits on copper from fiber to the basement is “fiber.” Japan is #1 if only fiber all the way to the apartment is considered. The U.S. is far behind in either case, with the larger countries of Europe – except Russia – even further behind. Nearly 60% of Korean homes subscribe to one or the other and over 40% of Japanese. So do 27% of Lithuanians. Yes, Lithuania leads Europe. They, the Russians and other Eastern Europeans generally deliver broadband by fiber to the basement and copper to the apartment, Speeds are often 100 megabits; Russia often is near the top in average Internet speeds. “Fiber” in the U.S. only reaches 8% of homes. The vast majority of U.S. fiber lines are Verizon, which has essentially stopped building. Russia is at the same level, expanding rapidly. China is only at 4%, although they are expanding at a rate of 10M a quarter. In Januray 2010 analysys mason delivered a report Fibre capacity limitations in access networks to UK Internet regulator Ofcom. The report, full of technical detail, and with very useful appendices of acronyms and a glossary, concludes that, in the short to medium term, fiber could handle double the predicted traffic. What’s more economies of scale and the implementation of photonic integrated circuit (PIC) technology. As new services become available and providers are forced to upgrade point-to point (PTP) networks would be easier to upgrade than passive optical networks (PON), because in a PTP network there is no passive (or active) equipment in the field and users can be upgraded individually. PON networks (such as FIOS) are cheaper to build than PTP, however operational issues regarding upgrades could prove to be a significant bottleneck, which could, in the worst case, prevent them from being upgraded at all. The recent How Amsterdam was wired for open access fiber report notes that they used PTP in preference to PON as it is much better suited to unbundling. As ICANN’s new GTLD process grinds forward, one aspect specified is that new applications should be compared to benchmarks. This required that such benchmarks be established by research. The resulting KPMG study has just been published. Most use open source database and server operating systems. The tech is not difficult. What has been a problem is accurately predicting take-up. Growth curves vary. What is certain is that immediate rates of take-up are a good indicator of the long term success. The majority of respondents indicated that their liquidity improved over time. Large registries ran operations in-house and had much much cheaper costs per registration ($1.74) than small registries, who normally outsourced operations ($15). It has been suggested to me that two unmentioned factors contribute to the above results. Marketing of previous new gTLDs has been abysmal. Neustar’s dumping of $40m into .biz seriously skews the financial results. The former problem maybe ameliorated in future if proposals to allow vertical integration of some registries and registrars are adopted. Open-source database and server software isn’t mandated by ICANN, it’s just that most people use it. There are, however, 25% of the surveyed registries who use Windows server software, so it’s not unanimous — just appears to be best practice (not to mention cheaper). Arstechnica reports on a new NTIA study – Digital Nation: 21st Century America’s Progress Towards Universal Broadband Internet Access. A new study by the Electrical Engineering and Computer Sciences Dept. at U.C. Berkeley, to appear at the 2010 IEEE Symposium on Dynamic Spectrum Access Networks, Singapore, analyses the nation’s white-space capacity subsequent to recent FCC rulings. This Report discusses some of the central questions that are raised by the FCC’s proposed net neutrality rules and finds that, on balance, maintaining the current pricing scheme is likely to be economically justified. While opponents of net neutrality are correct that it may have some downsides – including decreased investment incentives for ISPs and potential impacts on technological development -the government has tools at its disposal to mitigate these downsides. Moreover, the benefits of net neutrality, especially maintaining investment incentives for the development of new content, are very high. 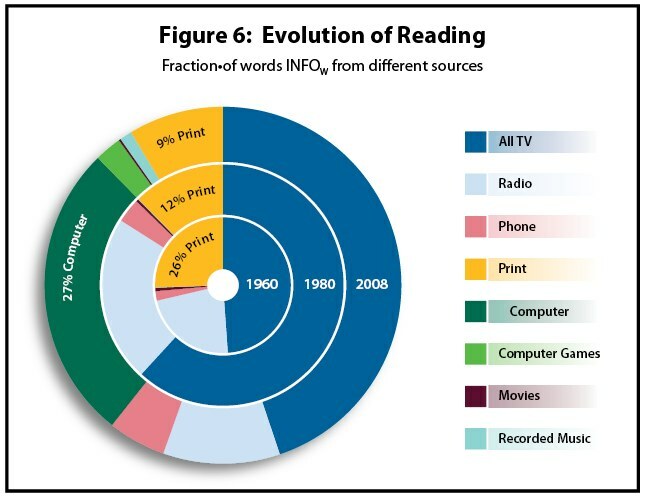 “Reading, which was in decline due to the growth of television, tripled from 1980 to 2008, because it is the overwhelmingly preferred way to receive words on the Internet,” found a University of California at San Diego study (.pdf) published this month by Roger E. Bohn and James E. Short of the University of San Diego. Americans consumed 3.6 billion terabytes of information last year, averaging 11.8 hours of information consumption per day. Video and videogames constituted 55 percent of those bytes, but on average, Americans read 36 percent of the 100,500 words they consume each day, according to the San Diego study, which analyzed more than 20 data sources. The study doesn’t cover writing, but a simple glance at Facebook feeds reveals that we’re almost certainly writing more than we used to, as well.